Early Morning Magic at Toy Story Land is going to give guests the chance to experience the new rides with little to no wait time. Not only that, but there will be a special buffet for event guests to enjoy. Disney has released the menu that will be available to guests experiencing Early Morning Magic at Toy Story Land. The breakfast will take place at ABC Commissary and will be served until 10 a.m. Guests can choose from a list of main dishes and the same goes for the children’s menu. There will be additional items at the buffet that guests can choose from that are included with the meal. So in addition to access to the newest rides in Toy Story Land before Hollywood Studios opens, guests also get to enjoy some good food! The fact that they are including this nice breakfast makes the price seem not as bad. The cost is $79 (plus tax) per adult and $69 (plus tax) per child (ages 3 – 9). 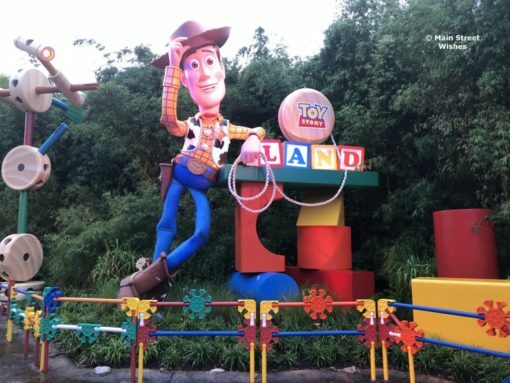 Early Morning Magic at Toy Story Land will be taking place on select Mondays and Wednesdays from 7:30 a.m. to 8:45 a.m from September to December. Please note that in addition to the event ticket, regular theme park admission is required to attend Early Morning Magic at Toy Story Land. To make reservations you can visit Disney’s website, call the Disney Reservation Center at 407-827-7350, or contact your travel agent. What do you think about the menu choices? « Where is it Wednesday: Where on Disney World Property is this Display Located?